Good evening.As the showers ended and the sky is slowly clearing up. Humidity kicks in.But at least it is warm and not raw and cool with the rain. 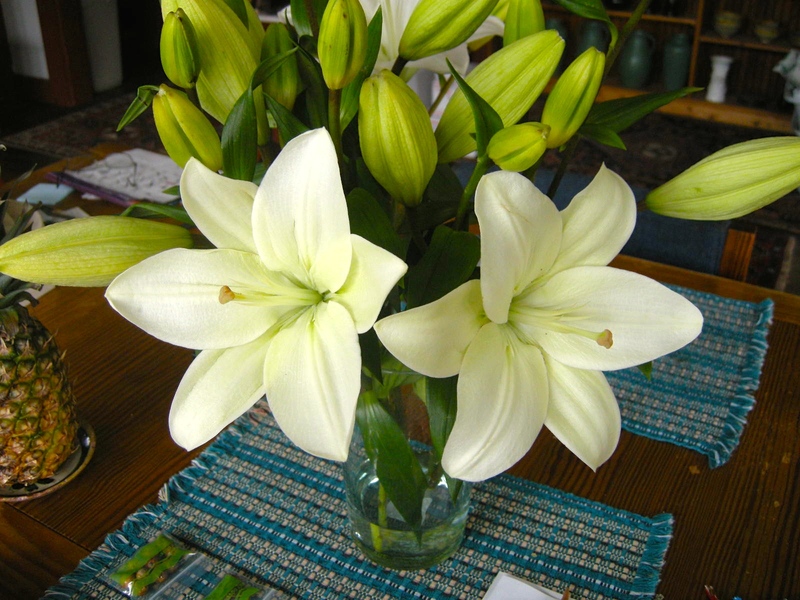 The flowers as you see in the picture here.I bought them last week. They are not bursted to bloom.These are my favorites. Have them most of the Summer. Hopefully to get some gardening done tomorrow.With things drying out. The grass need to be mowed.As the mower did not show up last week due to mechanical problem. For dinner tonight as we just about have this every week. Salmon,spinach,orzo which is my favorites. Salad.One piece of chocolate.Have one every day. Have a good night rest and see you soon. Those look like Easter lilies to me. Did you just buy the flowers or the plant itself? Very good flowers. I have an orchid here at home which has started blooming wgite flowers already.